Girls in the playground outside a school. The consensus is that this is Derby Street school. This is Derby Street School taken from Crook Street. this is definitely Gaskell Street School I went here. The Headmistress was Miss. Fletcher she was a large lady (as I remember) never married and as a treat in the last grade she would on occasion take the English class she inspired me. Definitely Derby Street School taken from Crook Street. The high building in the background is Hollas’s Mather Street Mill, which is still there. The major flaw with the Gaskell St argument is that there were never any trams running outside the school. Folds Rd did have trams but the school was in a different alignment. Other than this, other photos of Derby Street school confirm that this is it! I went to Derby street school these years as well. I remember a few teachers names the headmistress name was Miss booth. The teachers were Misses hay hurst,flood, McDermott and mrs cooper. I would like to obtain this photo would you inform me how to obtain it please, thank you. Peter Lodge seems to have it sorted. I had to laugh at the thought of trams going past Gaskel St. I attended this school (Derby st)the out building was the shower block as previously mentioned. I also worked at all the other schools named and it is none of those. I attended Derby St School from 1956 to 1960 and I am sure this is that school. I was in Miss Mitchells class that was behind the stage on the top floor. I would say that this school is Derby Street which I attended until 1960 taken from Flash Flash Street across the Road. This is definately Derby Street School. I attended from 1963 to 1967. 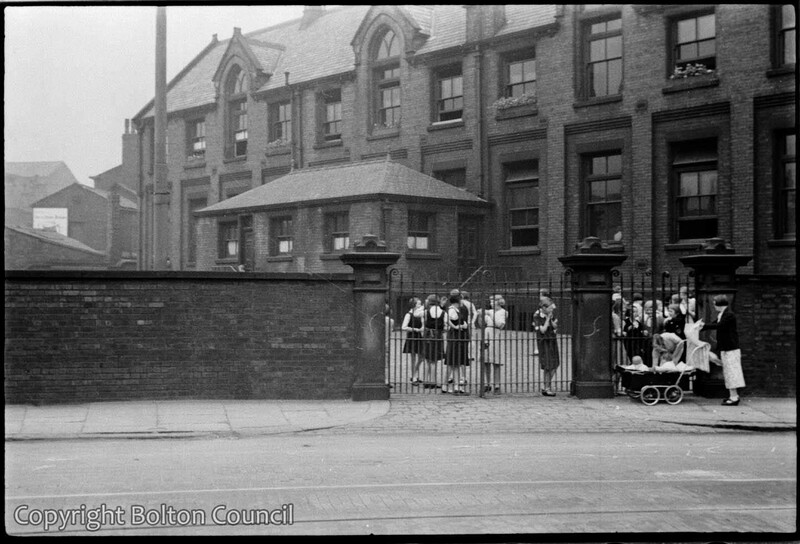 This was the only school in Bolton entirely for girls, which is why no schoolboys are in the photograph. I have very fond memories of the teachers and school friends I knew then.